September | 2010 | Ipoh Mali Talak Sombong! 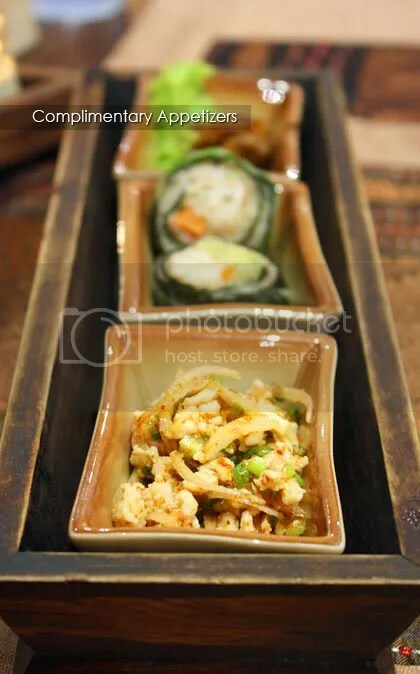 *Price for each individual dishes are not included here because I couldn’t find the receipt. I recently read about a place dishing out very good Sarawak kolo mee in Taman Kinrara, Puchong from VKeong’s blog. 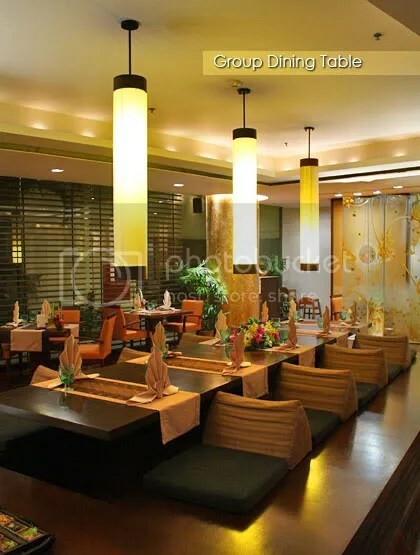 I was very eager to try it, so during on weekend night, I suggested to WMW to check out the place. It turns out that the stall was not open… we’re not sure if it’s only opens for breakfast and lunch (Headsteadi said that he’s open for dinner as well, though). Since we did not prepare any Plan B beforehand, we called Jackson who is staying around the area for recommendations. Yet, since we’re not familiar with Puchong, we’re still clueless about the places that he suggested. 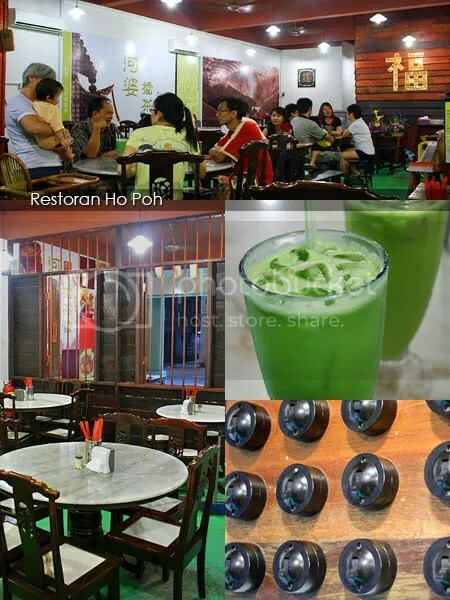 We then decided to go straight to Bandar Puteri Puchong and see what we could find, which eventually lead us to Restoran Ho Boh, same row as Axian Dim Sum. 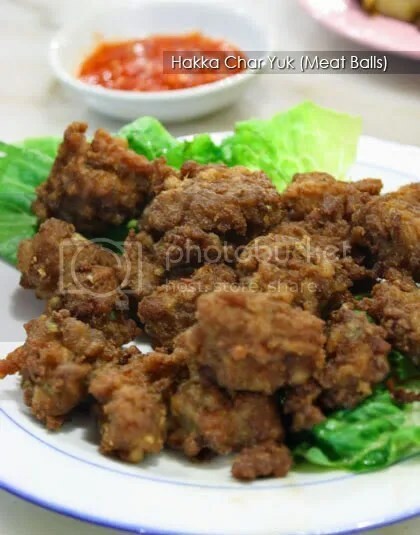 A quick check with the menu shows that they serves Hakka dishes. With Yam Abacus Seeds in mind, we settled with 4 dishes, 2 soups and 2 rice as we were really starving (it was already 9pm+!). The manager recommended us to try their special Bitter Gourd with Ambra (kedondong) juice, which was rather refreshing with no bitter taste at all. We practically loved all the dishes we ordered that night. 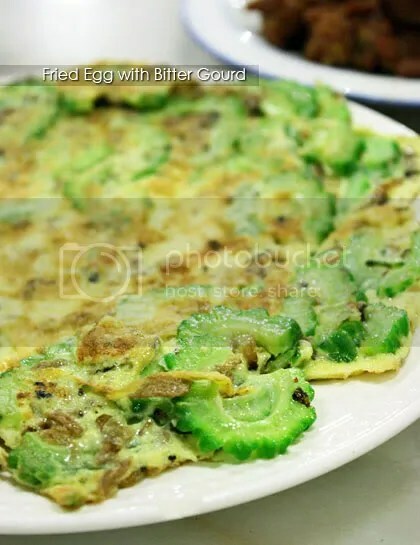 The fried egg with bitter gourd was full of “wok hei” (aka “breath of the wok”) and again, the bitter gourd were not bitter. They were quite generous with the amount of bitter gourd too. The Yam Abacus Seeds were soft and a bit chewy. 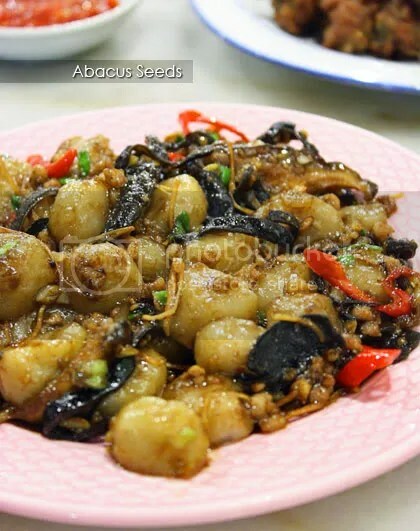 It fall short of our expectation (we prefer those with bits of yam embedded in it) but fortunately, the condiments of dried shrimps, mushrooms, chillies, black fungus, some smoked cuttlefish and scallions saved the dish. The Hakka meatballs were bursting with porky flavour and goes really well with the home made chilli dip. Size wise, they’re smaller than Peng Heong’s version but I’m not complaining here. 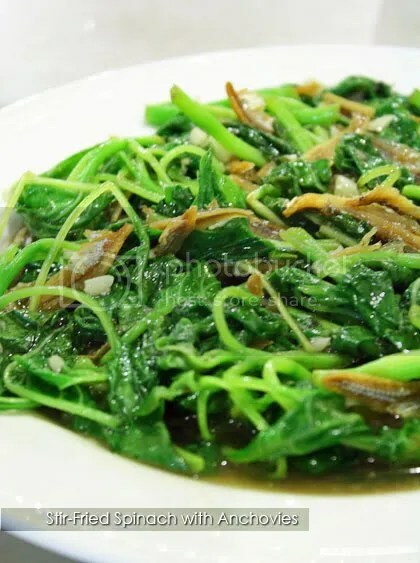 Stir-fried spinach with anchovies was simple but satisfying. 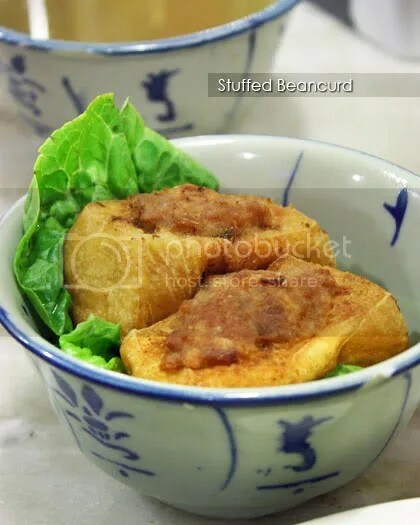 When the manager saw us with all the big camerasThe manager say that we brought in the crowd (the shop was rather quiet earlier), he treated us to 2 pieces of the Hakka stuffed beancurd for free! Good stuff as the outer part of the beancurd were crispy, while the minced pork stuffing was juicy and warm. Verdict: We left the place with a tummy full of Hakka goodies. Need more write ups? Click here, here and here. Why was I ended up at Hilton? That is because my friend joined the Hilton membership and has one night free stay voucher at any Hilton hotels/resorts around the world… hence, during a short gateway to Phuket in August, we stayed one night at Hilton Arcadia Resort & Spa, Karon Beach and moved to Patong the second day. Being a member has quite some privileges such as free buffet meals, 50% discounts on group dining, free upgrade to luxury suites and so on. If you’re interested to join or know more about the membership offers, do not hesitate to contact me. 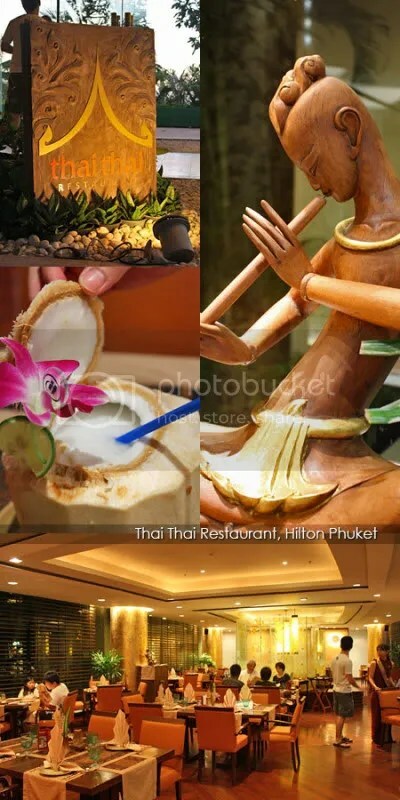 Initially, we wanted to have our dinner at those local shops but little did we know, Hilton Arcadia is a huge place! There were about 3 pools, 3 tennis courts, 4 restaurants and one golf course all stretched out on a 75 acres of lush tropical gardens. Walking from our rooms to the lobby easily takes about 15 minutes. So we decided to have our dinner in one of the in-house restaurant instead with 50% membership discounts. Since Sails was having seafood night that particular day (we’re not a seafood fan), we decided to go for Thai Thai for some fiery Thai delicacies. For your info, this place is not related to another Thai Thai restaurant in Sunway Pyramid. 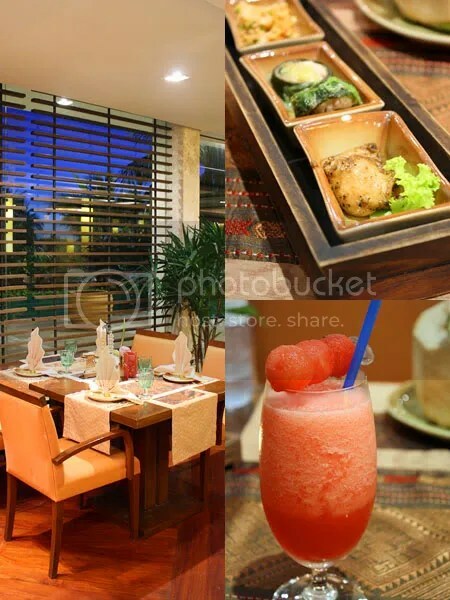 The place was tastefully decorated with a combination of modern and rustic Thai arts. Menu was extensive but we did not see pomelo salad or mango sticky rice in their dessert section, though. We received a complimentary appetizers (not sure if it’s for all patrons or only for Hilton members); minced chicken salad (foreground) was gorgeous with a tangy dressing, vegetable roulade (middle) was ok, nothing fancy and grilled black pepper chicken cutlets was lip-smackingly delicious. 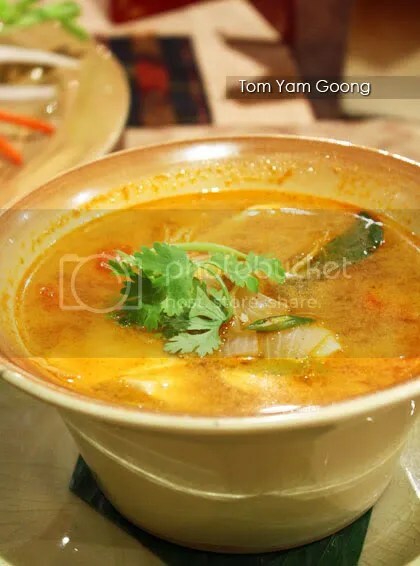 A traditional Thai spicy and sour prawn soup with lemongrass, galangal and button mushrooms (275 Baht). This was one of the better Tom Yum I’ve tasted in Phuket. However, the gripe kicked in later; CK claimed that the prawns doesn’t taste very fresh. 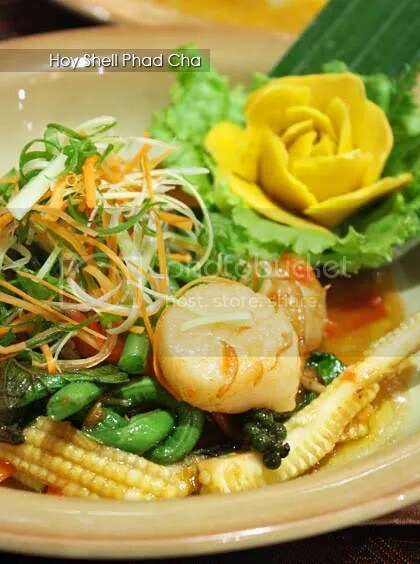 Northern-style stir-fried Australian scallops, baby corn, sweet basil and young peppercorns (425 Baht). 4 pieces of large, fresh (checked) Australian scallops were seared and then stir-fried with long beans, baby corns, sweet basil leaves and young peppercorns. The scallops were really fresh, plump and juicy but the sweet basil somehow masked the flavour of the scallops. The baby corns were crunchy and sweet, unlike any other I had before, which were usually bland. The last two dishes sadly, did not live up to our expectations. 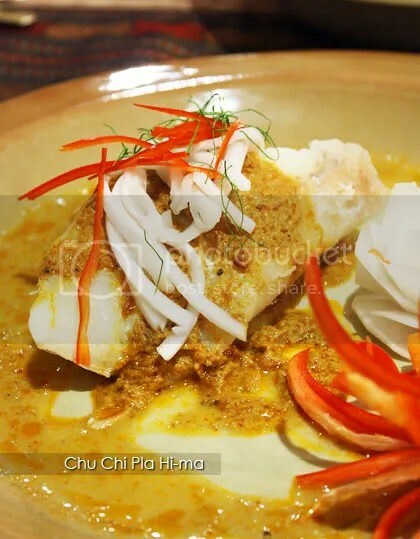 The Steamed Cod Fish with Red Curry (340 Baht) was disappointing as it was overcooked, rendered the meat dry and tough. 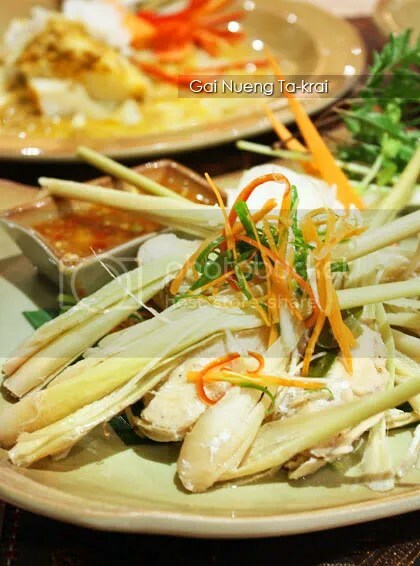 The same goes to Steamed Chicken with Lemongrass and Thai Herbs (355 Baht) – the presentation was quite messy with all the crushed lemongrass on top of the chicken but the aroma of the lemongrass was quite soothing. Other than that, there is nothing to shout about. Still got space for dessert? Of course! 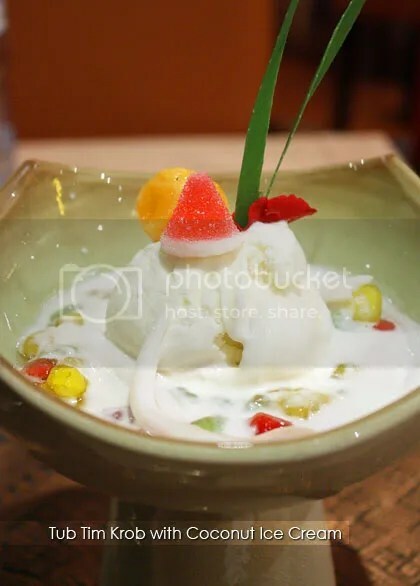 I had the Tub Tim Krob with Coconut Ice Cream (170 Baht), which came with not only just red rubies (water chestnuts), but also green and yellow ones and some coconut flesh. It was a trick on the palate as the coconut ice cream itself is sweet but the thick coconut milk was salty. Contrasting flavours in one simple dessert. Opens for dinner only, 6.00pm – 10.00pm (Monday – Saturday). Closed on Sundays. One day, I spotted some patrons happily slurping their noodles which looked like kon loh mee (dry noodle) to me, so I decided to give it a try. 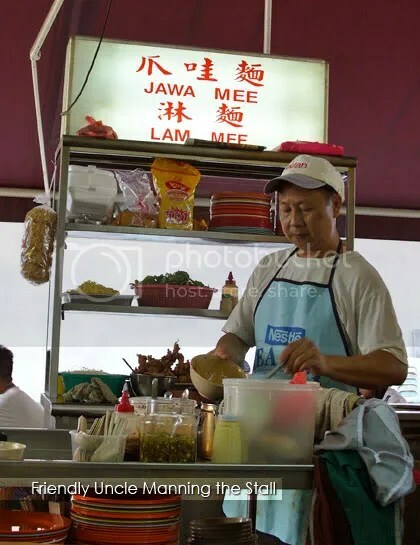 This particular stall, manned by an middle-aged couple also sells Jawa mee and Lam mee. The uncle (cook) is rather cheerful and friendly, while the wife (waitress) has a grumpy-looking face. She’s not rude, just that she doesn’t smile much. 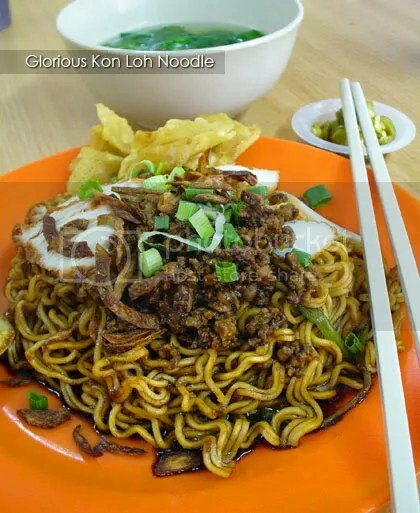 While their Jawa mee is rather ordinary, I went back for the kon loh noodles occasionally. You can choose the type of noodles you like; I usually go for one and a half portions of the air-dried and non-fried Vit’s noodles. Served with dark soy sauce, topping of minced pork, sliced roasted chicken, sliced fish cake, fried wantan, fried shallots, chopped spring onions, pickled green chillies and a side bowl of spinach soup, it costs me RM4.30 only. The noodles has a nice bite to it and the minced pork toppings were simply divine.